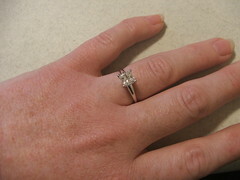 My boyfriend Frank (of 11 years) bought me this beautiful ring for Christmas. We actually went together to the Diamond District (Manhattan NYC) to pick it out. I got it a week earlier but we wanted to surprise our family so we didn't say a word to anyone. On Christmas morning we went up to my parents house for breakfast & I was just waiting & hiding it in my sleeve waiting for the perfect moment. As I was drinking a juice box my mom came over to hug me to thank me for the gift I got her.....as she was hugging me with my little sister standing right next to me I was moving my eyes for her to look at my finger. As she looked down she screamed & smacked me on the shoulder....she was sooooo happy!!!! She then ran into my father who was in the kitchen & the two came running out real excited! Everyone was REALLY excited!!!!! My grandparents, aunt, uncle & my 2 cousins where there also. Then anyone that called on the phone was told right away. After we left their house we went over to Frank's parents house. Frank was in the kitchen with his mom & called me in & said "Jen, show my mom what I got you"......she was so happy she started hyperventilating (it sounded like she was anyway) & crying as she was hugging me & him. Then we told his 2 sisters, they were also screaming & jumping up & down like crazy. So yes, it was a very interesting day Christmas 2007!